Winner of the Young Dentist of the Year, East, award, Dr Domingos Mamede is a mentor and skilled dental implant surgeon. Originally from Porto in Portugal, Dom now co-leads the surgical and implants department of mydentist’s Advanced Oral Health Centre in St Ives, Cambridgeshire having relocated to the UK to join the company nine years ago. When did you decide that you wanted to be a dentist and why? “At 17 my dad gave me some good career advice. I told him I wanted to become a pilot and travel the world. My parents have always been very supportive, but the guidance he gave me that day has shaped my whole career. Instead of taking to the skies immediately he suggested I keep my options open, go to university and study towards a career that could help fund my passion for flying and travel. ‘Why not medicine or perhaps dentistry,’ he said. I took his advice, applied for university to read dentistry and quickly realised that I enjoyed it. You have been involved with volunteering as well? I was lucky enough to be one of the first dentists to visit Tanzania as part of a partnership between mydentist and Bridge2Aid. The experience was very humbling and eye opening, we were there to provide urgent treatment and to help train local health care workers in dentistry and how they could create sustainable and free access to communities who wouldn’t otherwise have treatment. What is it about dentistry and life that you find most fulfilling? It is amazing to feel that you can have a direct impact on the quality of life of your patients, whether by improving their self-esteem, their confidence and their dignity or by allowing them to choose what they can eat not based on what they can chew, but what they feel like eating. And that’s why I am so passionate about dentistry in general and implant dentistry in particular. I feel very fortunate to have my career. I often catch myself and think ‘how did I end up here?’. I’m only 35 years old and I have a career I love, that continues to challenge me and within a company and team that allows me to develop and to grow, both personally and professionally. I also live in a country that I enjoy, I’m married to my soul mate and best friend Claudia and just a few months ago we had our first child, a beautiful baby girl. Life is good. How does working in St Ives compare to other places you’ve worked? I enjoy working in St Ives. Before I came to work in England I decided I wanted to move to a part of the country that would show me real British culture and the way life. A lot of people I knew were moving to London, but I’d already visited there and although it’s a great place to visit, I wanted to see and experience more of the UK. So, when a vacancy came up with mydentist for a position in one of its practices in Warrington I jumped on a plane and headed to the North West. A couple of years ago I moved to Cambridge with my wife, who’s also Portuguese. We love our life here, the practice and the patients. What’s more, because it’s only a short drive to Stansted airport it means we are able to fly back to Portugal regularly so the grandparents can spoil our little girl. And being able to enjoy my personal life has been a big part of all the professional decisions I’ve made. By being self-employed I can be flexible with when I work and when I don’t. That’s allowed me to travel whenever I want and as a bit of an adrenaline junkie I’ve been able to indulge in bungee jumping, sky diving, flying. There hasn’t been much time for travel or extreme sports lately since becoming a dad though. You’re renowned for your success in implant dentistry… to what do you owe this reputation to? Honestly, I think I am just starting. Every day I push myself out of my comfort zone, put in the hard work and having people around me that believe in me and who have offered encouragement. After all, you are only as good as the people that surround you. While working as an NHS dentist for mydentist I trained in Dental Implantology at Trafford Hospital in Manchester with Professor Cemal Ucer and did further training in Aesthetic Dentistry at UCLA in Los Angeles a couple of years later. The Msc in dental implantology from Edge Hill University has been a very tiring, but very fulfilling experience. 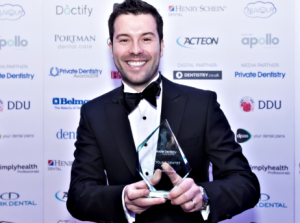 In 2013 I accepted an invitation to join mydentist’s flagship practice and training academy in Manchester, where I was able to complete more dental implant and aesthetic dentistry cases. As a new private dentist I had the extra challenge of establishing myself in a competitive city centre market – a challenge I actually really enjoyed. I then moved to Cambridgeshire and started the challenge of building my credentials and referrals as a dental implant surgeon all over again – and finding myself enjoying it once again too. And then mydentist chose the practice in St Ives to launch one of its first Advanced Oral Health Centres a little while ago. These centres have been formed around the company’s leading practices, and branded as centres of excellence, where patients benefit from the latest digital dentistry technology and treatment from our clinicians. Our practice now also acts as a hub to help a network of local practices, whether inside or outside the mydentist group. We encourage professional development and improved care by offering mentorship in everything from foundation dentistry through to implantology. Being part of mydentist means you have opportunities to grow you couldn’t find elsewhere. There is a whole network of professionals you have access to and can learn from. There is investment when you want to expand your offering and gain new skills. I know some people have a negative view of being part of a corporate but that has never been my experience, quite the opposite, being a part of mydentist has given me the opportunities to progress I craved for and it is a great place to work. How important is mentoring to the profession? It’s very important. I’ve always believed that you should give back what you’ve learned along the way. Is great to work with local dentists, and to meet them on clinical panels, peer reviews or through lunch and learn events. We cover as much as we can, from offering advice on becoming a confident dental implant surgeon to how to improve patient’s journey, and how to increase private revenue. Last year was asked to be an ambassador for mydentist to help recruit dentists in Portugal. I felt honoured to be invited and involved. After all it’s a journey I took myself not that long ago. Becoming a father has been a life changing achievement. It’s been an adjustment. I spend a lot of my time in the car on my commute and pass the time listening to audio books. I’m currently listening to the ‘New Dad’s Guide’. Professionally, my biggest achievement is reflecting on the career I’ve been able to establish within implant dental surgery. It’s a tough career path to follow, specially with the current medico legal environment, but I had and still have great mentors along the way to guide me, mydentist support and encouraging me and family and friends supporting me. I’m proud of what I’ve achieved – but my career path isn’t finished yet. I have lots more I want to do. So, where do you hope to be 10 years from now? You’ll have to watch this space to find out.